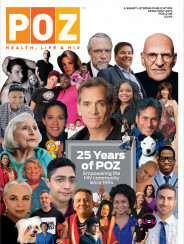 The 2nd Annual POZ Awards spotlighted the best representations of HIV/AIDS in media and culture. 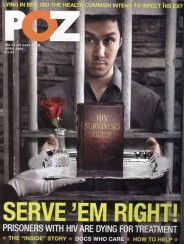 The POZ editorial staff selected the nominees, but POZ readers chose the winners. Eligible nominees were active or were presented, published or produced between October 1, 2016, and September 30, 2017. Voting for nominees was closed at the end of World AIDS Day, which was Friday, December 1, 2017. Leonardos came out publicly as HIV positive while under the critical gaze of millions of viewers watching Finding Prince Charming, the first all-gay reality dating show. Leonardos won the romantic horse race, but, more important, he continued to share his story and became involved in events like the annual AIDSWatch in Washington, DC. The ABC miniseries brought must-see television back to our living rooms, at least for LGBT audiences and allies with an interest in the early days of gay rights, and eventually AIDS, in San Francisco. The series has lessons for us, including the contributions of early heroes like (NAMES Project AIDS Memorial Quilt founder) Cleve Jones, trans activist Cecilia Chung and even a certain young singer by the name of Sylvester. Pearce portrays gay icon Cleve Jones in his adult years in the ABC miniseries. German documentarian Nicholas Feustel eyes the progress of PrEP in London and profiles the advocates demanding access to it in a film commissioned by the London-based PrEPster campaign. An intimate look at how AIDS activists, from the early 1980s to the present, have defined their home, lives and loves. D’Adesky brings the perspective of a lesbian feminist to the HIV activism landscape in this lush dreamscape of an AIDS memoir. Perhaps the most discussed and rapidly shared message to hit the HIV arena in years, U=U (“Undetectable = Untransmittable”) is prevention literacy for people living with HIV. It is also the single, precise message of Prevention Access Campaign, which collaborates with nonprofits, government agencies and HIV prevention advocates interested in creating their own materials to share it. The striking visuals of this campaign—black and white photographs of pairs of lovers in every possible combination of gender and sexuality—brings an immediacy matched only by the candid language and message. Political policies endanger our health care and HIV research. The national political landscape is frightening for people with HIV and our allies. The hostile environment includes repeated attempts to repeal the Affordable Care Act (ACA, or Obamacare) and replace it with legislation that would deny Medicaid and insurance to tens of millions of people; deep proposed budget cuts to the Department of Health and Human Services; and disturbing slashes in National Institutes of Health research just as so many promising breakthroughs are in sight. Our activist groups are working overtime to stem the constant threats.